Main findings: Significant drop in interactions for biggest profiles analyzed, rising interactions for smaller profiles, number of tweets remain unchanged, declining follower growth since last year. 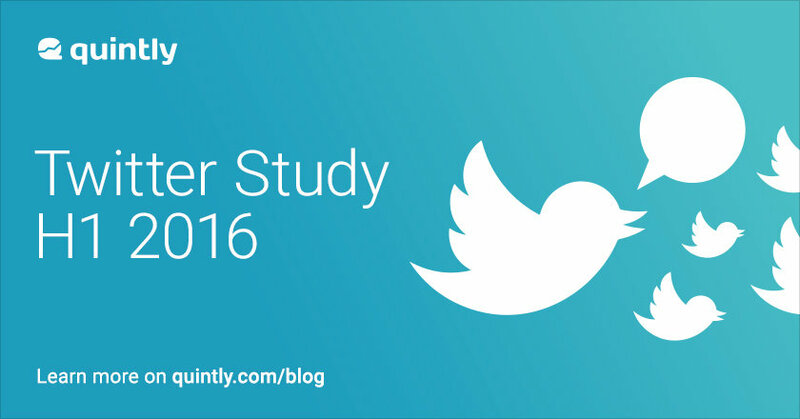 The social media analytics provider quintly published a Twitter study analyzing 30,000 Twitter profiles during the first half of 2016. The analytics company reveals changes that are relevant for businesses which market on the micro-blogging service. While interactions for the biggest profiles analyzed dropped by 58% comparing H1 of 2015 with the present year, smaller profiles tend to receive more interactions than they used to. "The different aspects analyzed such as tweet frequency, interaction rate and follower growth enable readers of our study not only to see developments but also allow to draw conclusions of what that means for their business. We found that the biggest profiles need to endure a high follower loss, whereas smaller profiles seem to be able to benefit from Twitter." To make this study easy to interpret quintly chose the most important metrics such as number of tweets, growth rate and interactions rate and discussed the outcomes briefly. By clustering the analyzed profiles in six differently sized groups the study is applicable for every marketer.